You are here: Home / Acts / That’s going to leave a scar! “Yep, that’s going to leave a scar!”- were the first words out of my mouth when one of my soldiers was shot in the leg on accident. I know these don’t seem like the most compassionate words, but you really had to be there to understand just how funny this event was. I was temporarily serving as a chaplain candidate in Fort Knox, Kentucky, when the unit was conducting rifle marksmanship as part of its basic combat training. The trainees from one company were in the barracks cleaning their weapons after completing a long day of training at the rifle range. Somehow, one of the trainees left the rifle range with a bullet still in the chamber. 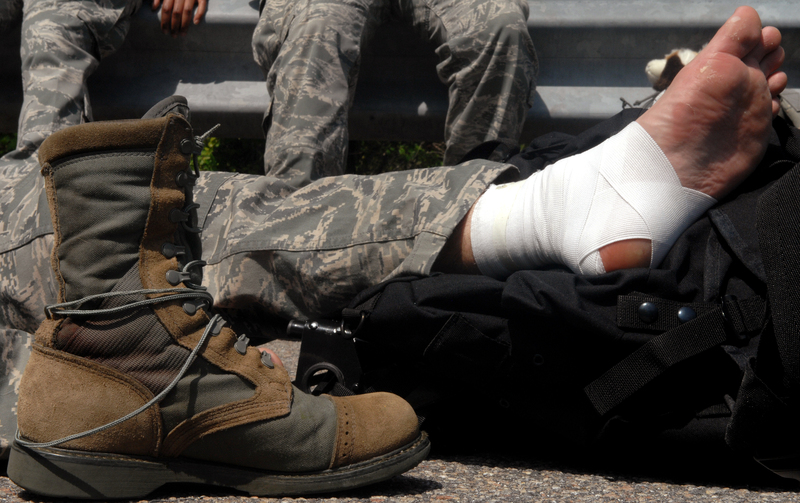 (It is unimaginable that this soldier was able to make it through the many safety checks between leaving the range and getting to his barracks. However, somehow this safety system broke down at every level.) The soldier was sitting on his bunk getting ready to clean his weapon when he pulled the trigger and fired the round that was still in the chamber. This bullet went directly across the room and hit another soldier in the leg. This was the perfect gunshot wound. The bullet missed the bone, major veins and arteries, and significant nerves in his lower leg. It literally missed everything important and punched through one side of the leg and out the other. If there is a better way to get shot in the leg than this, I have never seen it! This is why the first words out of my mouth when visiting the soldier at the hospital were… “Yep, that’s going to leave a scar!” Amazingly, he was able to leave the hospital relatively quickly and finish basic combat training with the rest of his unit. This soldier had only been in the Army for a few weeks but was going to have a story to tell for the rest of his life. This soldier reminds me of a guy named Stephen in Acts 6:8. The Bible makes two statements about Stephen in this one verse. The first is that he is a man “full of grace”. We’ll talk about that more in just a second. The second statement is that Stephen is a man “full of power”. I believe it takes great power to be able to suffer the kind of abuse that Stephen suffers in the Bible and not demand revenge. I believe it took great power for this soldier to endure the gunshot wound in basic training and not take revenge on the guy who shot him. As much as I don’t like to admit it, it takes more power to take a punch than it does to give one. Stephen is a guy who can take a punch. I think this is the essence of what Jesus was saying in Matthew 5:39. It takes a lot more strength to receive a slap in the face and not try to get revenge. Perhaps Stephen was able to take the punch because he is also a guy who is full of grace.